The Embarcadero Community Technical Newsletter is an email newsletter for members of the Embarcadero Developer Network. If you would like to cancel your subscription, click on the hyperlink at the end of this message. For ISVs and Enterprises the #1 application development challenge today is supporting the growing heterogeneous mix of Windows and Apple devices, UI approaches, OS versions, and emerging form factors. To turn this mounting challenge into a competitive advantage, developers need an edge, a way to virtually replicate their R&D staff several times over. Embarcadero? RAD Studio XE3 is your developer force multiplier and the fastest way to build data-rich, visually engaging applications for Windows 8, Mac, .NET, Web and mobile. 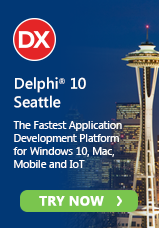 You get Delphi?, C++Builder?, Embarcadero Prism?, and HTML5 Builder so you can deliver applications 5x faster across Windows 8, Mac OS X including Retina display, and more. CodeRage 7 is scheduled! This year we are having two CodeRage 7's one focused on everything Delphi (November 6,7,8) and one focused on everything C++ (November 13,14,15). The call for papers is available if you want to be a presenter at this annual online virtual conference. You can also join as an attendee. ER/Studio XE2 is the fastest, easiest and most collaborative way for data modeling professionals to build and maintain enterprise-scale databases and data warehouses. Built in facilities automate routine modeling tasks so users can analyze and optimize database and data warehouse designs faster than ever. With a server-side model management system and online portal, it is simply the most productive way to share, document and publish your data models and metadata to distributed teams. Demands for always-on, high-performing enterprise databases have never been greater. But with the need to achieve more with less, database professionals continually look for innovations to help them meet corporate expectations. DB PowerStudio XE3 is the latest suite in a line of award-winning database tools for DBAs and database developers.